I picked up the Kyrie 2 on release day – something I don’t always do with performance shoes – but I was excited to get in them for a couple of reasons. First, I was intrigued by the construction. The radiused outsole is something we haven’t seen much of in a performance hoops shoe, and especially not to this degree. I really wanted to see what kind of affect it would have as far planting and changing directions quickly. Second, my beloved Rose 6s are having a couple of durability issues and I needed to pick up a new pair while I send the Roses back. 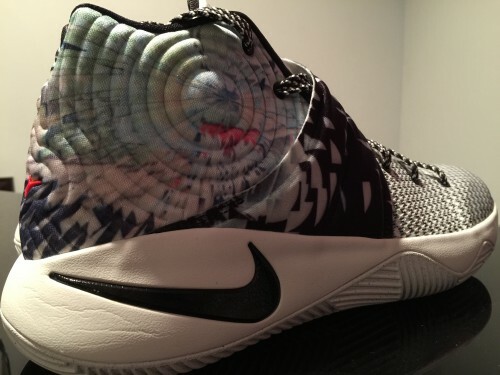 What follows is a brief rundown of the 5 aspects of the Kyrie 2. You can also check out more info on the shoe over at tackl.com. I was immediately impressed by the overall lockdown. The Fuse upper laces up very tightly and the tongue extends up higher than normal for a pretty secure feel. The midfoot strap only enhances the lockdown across the top of the foot, and I don’t have any movement to report on the interior. I don’t anticipate the strap causing any discomfort, as it’s pretty flexible and is well placed across the foot, helping to lock the foot into the heel of the shoe. Very good overall. The midsole is a bit stiff right out of the box, but it breaks in well in no time. 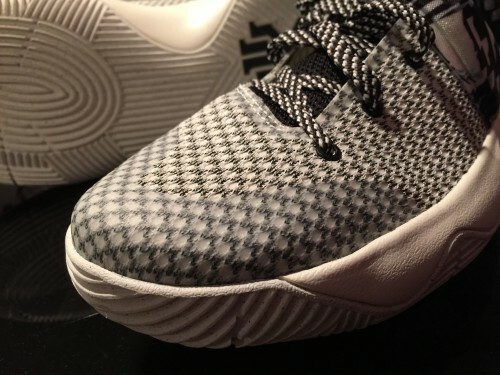 The footstrike, thanks to the curved outsole and midsole, felt a little weird to me at first. I felt like my foot wanted to roll inward slightly off the big toe with each step, but I have to think that’s by design with the curved sole. Some extra support on the medial heel would have been nice in my opinion, but you really feel the effects of the curved sole with each step. I think the curvature is a good idea and while it’s not going to make you blow by every defender now, it does promote easier movement when changing direction and off my first step. It was a bit of a shock going from the plushness of the Rose 6 to the rather spartan setup in the Kyrie 2. It’s firm and plays low to the ground, with decent flexibility and responsiveness. The heel Zoom bag is…there I guess? I never was a huge fan of heel Zoom since I don’t typically play on my heels. Would have loved to see it in the forefoot, but I have a hunch that would play well with the curved platform. As a guard, I like the cushioning setup from the freedom of movement standpoint, both laterally and in a linear manner, but it’s nothing outstanding. 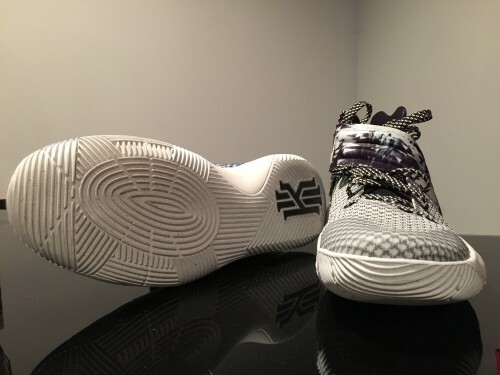 The multi-directional traction pattern was designed so that Kyrie would be able to stop on a dime or accelerate as fast as he needs to. I, as a matter of fact, am about 1/100th of the athlete he is but for me it’s worked very well. It’s rather soft, however, so I don’t anticipate it being a good outdoor option if you hoop a lot on asphalt. So far I’ve been very impressed. Fuse is pretty much bulletproof and this iteration feels like it’ll last awhile. The midsole is Phylon and feels pretty supportive out of the box. Overall, the fit and finish is very good. After three wearings and a total 0f 5 or 6 hours, I’ve been impressed with the Kyrie 2. I like feel of the radiused sole and I think it’s an innovation from Leo Chang that directly aids performance. We’ll see what a couple more weeks brings, but I’ve liked it so far (especially at $120). I’ve read some people not loving the cushioning and I agree to a certain extent – it’s pretty firm and there’s not a bunch of responsiveness. But in order for that curved sole to function, it kinda has to be thin and firm like that. Zoom would be great but I don’t see how a zoom bag fits in that sole. Met bag like Kobe v vi? They wouldn’t be my first choice. Pliable, softer rubber traction pattern and almost no forefoot cushioning would be rough outside.